Since I'm a huge fan of chocolate and cherries, I wanted to create create a cake bread that combined the two. And, something about using almond extract always reminds me of baking Christmas cookies. I played around in my pantry and created this Chocolate Cherry Almond Cake Bread recipe ... and wow, I LOVE how it came out! It's almost a cross between a brownie and decadent chocolate cake. I used cake flour to make it spongier and chose low-fat ricotta to tap into my Italian roots. Great gift for the holiday and you can be sure I'll be giving it to family and friends! Whisk or sift together cake flour, cocoa, salt, baking soda & baking powder in a medium mixing bowl. Set aside. Using a Kitchenaid mixer or hand mixer, combine brown sugar, ricotta, eggs, canola oil, buttermilk, and almond extract; mix well. Add flour mixture to wet mixture a little at a time and mix until well blended. Do not overly beat mixture. Bake for 35 min or until toothpick comes out clean. To create icing, mix ingredients together in a pyrex bowl with a whisk. Drizzle icing on top when cake is cool. 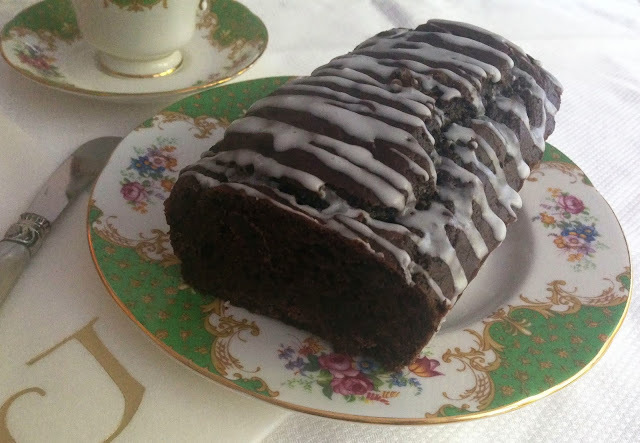 Don't miss my other cake bread recipes .... they are all low-fat and yummy. I bet you won't be able to eat just one slice! Have a sweet day - Happy Baking! Image via: Bella Bella Vita (not the best shot I've ever taken ... terrible lighting, but I couldn't miss posting this during the holidays! New Year's Resolution #1 - take photography class)!